Why Sound Mazes Are Our Favourite Method..
Soundproofing a room can seem like a never-ending task, there are plenty of ways that sound can get into or out of any room. You may have soundproofed your walls, windows and door and still find that sound is getting in through your air vents. Air vents are (obviously) designed to encourage the circulation of air. Typically they are placed above a door, they are common in places which regularly experience high temperatures. As hot air in a room rises it will travel through the above door vents which will help to reduce the temperature. Unfortunately, this means that the air vents do absolutely nothing to stop airborne sound travelling straight through them. If you’re having problems with excessive noise getting through your air vents then keep reading for tips on how to soundproof an air vent. If heat is as big an issue as noise then creating a vent sound maze is the best option to solve your air vent noise problem without restricting the movement of air. Sound Mazes allow air to continue circulating freely through your air vent while being incredibly effective at deadening sound. Plywood dividers bounce sound waves out of the air vent . Acoustic foam deadens the sound waves. ​There is no danger of compromising your air vents primary purpose of providing ventilation. Creating a sound maze inside your air vent will allow hot air to escape through it but it also means that sound waves have to bounce off multiple surfaces and travel much further to get into your room. This causes the sound waves to use up their energy far more quickly thereby significantly reducing the impact of external noise. The diagram below shows a plan of how you should build your air vent maze. As shown you should aim to cover as much as possible of the interior of your vent with acoustic foam. As this will minimise echoes. Use a screwdriver to remove the air vent covers. Measure out the internal size of your air vent. Mark your plywood up and cut it to size so that it will fit inside the vent. Cut about 30% off the top of the plywood panel to allow space for the air to travel. Make at least 4 plywood inserts, preferably more if you have enough space in your air vent to fit them. Cover both sides of the plywood with acoustic foam. This will help prevent sound from echoing off the panels and will help use up sound energy before it makes it through your vent. Apply glue to the edges of the panels and glue them into place inside the air vent. Leave around 1 inch / 2.5cm of space between each panel, the closer your panels are and the more panels you use the better the overall soundproofing effect will be. Cover the sides and top and bottom of your air vent with acoustic foam as you go. This can be fiddly so it may be easier to cover the whole inside with acoustic foam before you start adding in the panels. Then simply cut a space in the foam to glue each panel in. Doing this will help further reduce echo. Reattach the air vent covers and you’re done! Acoustic foam is something that we don’t typically recommend using in most soundproofing projects. The reason for this is that strictly speaking it is not a soundproofing material. Acoustic foam is designed to reduce echo, specifically in sound recording studios or cinemas. It isn’t designed to block sound but rather is intended to improve sound quality in a room. However reducing echo can make a big difference with air vents as they are often very echoey…especially if they are made of metal. 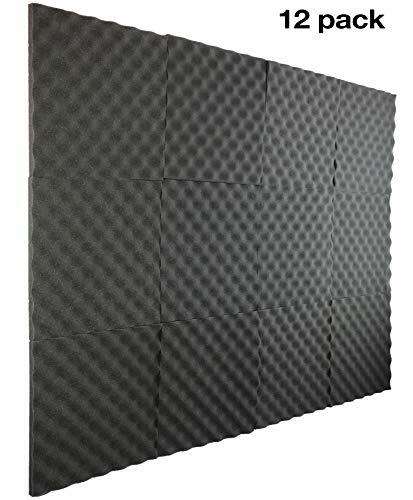 New Level 12 Pack- Acoustic Panels Studio Foam Egg Crate 1" X 12" X 12"
To soundproof your air vents using acoustic foam simply take off the air vent covers, then glue acoustic foam to the inside of the vent cover ensuring that the foam covers all of the gaps. Do this on both the internal and external vent covers. While this method will be nowhere near as effective as creating a sound maze it can help minimise background noise and still allows air to freely travel through the vent. Another vent soundproofing option is using a sealant to fill the gap. 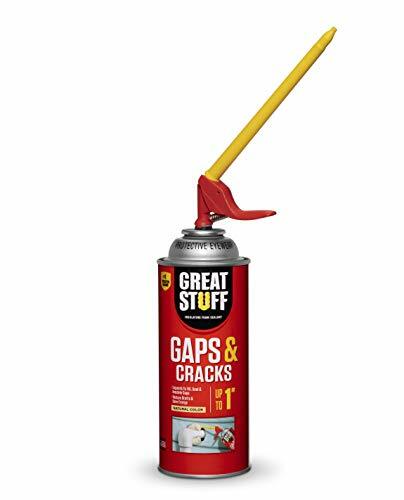 Apply the sealant liberally to the inside of your air vent. It will then expand to fill the available space (add more if required). It only takes a few minutes to set and once it has set it will create air and watertight seal inside your vent. Once it has set use sandpaper to flatten it off at both sides of the wall so that you can fit the vent cover back on. And there you have it – all done! This is by far the quickest, easiest and cheapest method of soundproofing your air vent and it is arguably just as effective as all of the methods mentioned on this page. If heat isn’t a big issue in your room or apartment then blocking your vents is a viable option for blocking sound. Take off the vent covers on both sides of the vent. Cut a piece of plywood out that will fit on the back of the cover, ensuring that it is slightly smaller than the cover so that it fits inside the air vent. Glue the plywood onto the vent using green glue. For extra soundproofing use some weather stripping and tape it along the inside edge of the cover so that when you screw it back into place the stripping is pressed tightly against the wall. So maybe you need your vents and you don’t want to block them because they help keep your room cool during the peak of summer. In this case a good option is to find a way of covering them with a temporary cover. Something like a soundproof blanket or a soundproof curtain is ideal. Simply install a curtain rail above your air vent, then hang a curtain on it. The curtain doesn’t necessarily have to be a purpose made sound-resistant curtain, just make sure it is thick and dense and has multiple layers as this will help deaden sound vibrations that travel through your vent. If your air vent is above your door getting a floor to ceiling curtain will help minimise any sound that may be leaking through your door. A curtain won’t block air from getting through your vent but it will help deaden sound and when the summer months come and you want to let as much of the hot air out as possible all you need to do is open up your curtains. If your vents are close to the floor rather than above the door a very simple way or reducing the amount of sound that gets through them is to strategically place some furniture in front of them to break up any sound that enters. Placing a soft sofa or armchair in front of your air vent will be more effective at sound reduction than placing hard furniture such as a bookcase or wardrobe. This is because the sound will bounce straight off a hard surface whereas it will be absorbed and partially deadened by a soft surface such as an armchair. We hope this article has been useful in giving you some ideas on how to make your air vents less of a noise problem in your home.